I didn't know we could quote across threads. Learn something new each day! It is called copy and paste. Give me a moment. I am thinking of some ideas for conversation here. Yes page 27 is a shocker. Mr. Belvedere is the total package. Care to come to mine later? Mother won't be home. Well, yes, I know Belvedere is peculiar. But that's because he's a genius. There is so much to love here that I would not know where to begin. Well... I had already begun above, as you can all see. An old stereotype term for an overly dramatic gay man is "queen" and, no, this film does not use this sometimes offensive word... even if some today still enjoy its usage. However the big battle is between two lead characters who are certainly not "kings". That name is reserved to Maureen O'Hara and Robert Young's Tacey and Harry King. They are hosts to the more powerful and winning... um... king of Hummingbird Hill. 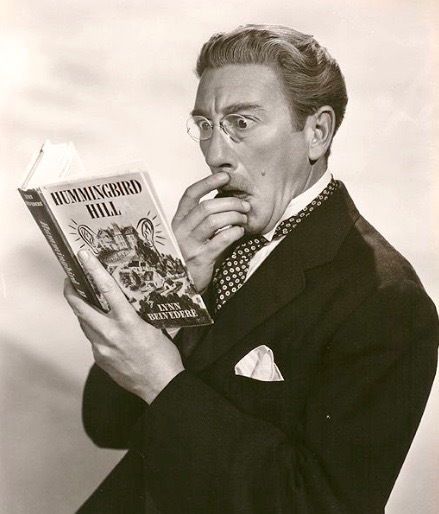 As swarmy as Clarence Appleton is, there is no denying that Richard Haydn revels in his performance. Walt Disney must have been mighty impressed because, by 1949-50, he was recording a virtually indistinguishable voice as The Caterpillar in Alice In Wonderland. Like Clarence in this movie, that Lewis Carroll-Disneyfied icon loved to sit among the flowers, even if his preferred seating place was on a mushroom. Yet actor Haydn played a wide variety of roles; ironically his most famous for the Baby Boom generation is Max in The Sound Of Music, which is so much more subdued. There are lines that just make your jaw drop for no reason. 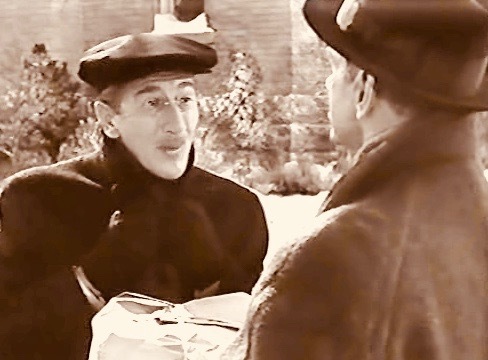 When asked if he can bath Rodney (boy #3 younger than Larry and Tony), he replied that he has bathed people of all ages and both sexes with no complaints before. However Daddy King is not permitted to talk to Rodney because bathing is serious business! It is obvious why Robert Young starred in Father Knows Best. He is definitely the kind of Daddy any small boy would want. Never reprimands anybody. Always smiling. Very patient with all of the toys strewn around and the Great Dane being overly affectionate with him when he arrives home. Tolerates baby sitter Ginger. Makes a snow-man with Mommy. In contrast, Lynn Belvedere is the rough and tough one. Unfortunately poor Harry King is not master of his home, losing out in every argument and also unable to deal with his boss, played by uptight Ed Begley. Begley's character as Mister Hammond would certainly not survive in this modern #MeToo era since he is pinching his secretaries until they "are black and blue". He would have so many law suits bigger than the one he wages against tell-all writer Belvedere. We see briefly the Fox Movietone Newsreel cameramen documenting Lynn's success. I like these in-studio references, this being a 20th Century Fox feature, resembling the Paramount News documenting Norma Desmond in Sunset Blvd. two years later. When agitated, Mr. King tells Mr. Belvedere "Stop shredding that lettuce!" Response with eyes rolling up: "Life must go on, Mr. King"
The infamous birdcage. (No comparison to that... other movie.) Only he can make the canary sing though. Great write-up, Jlewis! I'm going to have to watch it again. When Tacey King goes home to mother after a disagreement with Harry, their suburban nest turns into a house of all boys/men. Belvedere keeps things running in her absence. The scene where Tacey and Belvedere dance the rumba is used in some of Fox's advertising for the film. Not sure if they wanted to make it seem like Belvedere was heterosexual in the ads, or if they were playing up the fact Clifton Webb had a career as an accomplished dancer, which people would have known. Trivia 101: Betty Lynn plays Ginger the babysitter. She would play O'Hara's daughter in Fox's FATHER WAS A FULLBACK a year later, another family comedy that took place in suburbia. There were two sequels, where Webb carried on as the main character, but the Kings are not included in the sequels. In one of them, Belvedere has gone off to college; and in the other one, he's helping a group of elderly folks at a rest home. Though still good, neither one captures the magic of the first picture. Fox struck gold in the 80s when the studio transferred the concept on to the small screen. For six seasons Christopher Hewett starred as Mr. Belvedere on the ABC television network. The family name was changed to Owen, and the series was set in Pennsylvania. A total of 117 episodes were produced. Most of them are currently on YouTube. I did watch that when it aired. Not all the episodes, but enough. It was moderately amusing, obviously lacking the curious subtexts of the original. What I haven't seen all the way (just in segments) are the movie sequels, Mr. Belvedere Goes To College and Mr. Belvedere Rings The Bell. I did watch that when it aired. Not all the episodes, but enough. It was moderly amusing, obviously lacking the curious subtexts of the original. What I haven't seen all the way (just in segments) are the movie sequels, Mr. Belvedere Goes To College and Mr. Belvedere Rings The Bell. MR. BELVEDERE GOES TO COLLEGE is notable for featuring Shirley Temple whose previous film at Fox was in 1940. This was a special return to her old stomping grounds and she would soon retire from moviemaking. MR. BELVEDERE RINGS THE BELL is my least favorite. Mainly because all they did was take a play that was not a hit on the east coast and just superimpose the Lynn Belvedere character on top of it. We should have seen the Kings again. There's no reason why this series couldn't have continued the way BLONDIE did. It was to show his dancing abilities. We here are examining all of the curious gay subtexts, but Hollywood wasn't all that concerned back then whether or not he was heterosexual enough. This was still the very dawn of the Kinsey Era, so there wasn't a whole lot of discussion just yet. Also he is very NON-sexual in his personality, a bit like Mary Poppins (i.e. apart from flirting with Bert about Jolly Holidays, she was all "spit-spot"). Just that you can see how frustrated Clarence is with him. It is a mix of infatuation, possibly sexual on a subconscious level, and jealousy. This rival has infiltrated the King-ly palace on the block where he thought he was the main gossip. Regarding the dancing: When Harry admits in the finale that he is not as good as a dancer as Mr. Belvedere (since earlier he got jealous for heterosexual reasons), Tacey insists Harry is "much prettier". At close we hear "Pretty Baby" again. Again, much earlier Little Larry tells Harry that he thinks Mr. Belvedere is "cute", which makes Harry feel less loved. Regarding the dancing: When Harry admits in the finale that he is not as good as a dancer as Mr. Belvedere (since earlier he got jealous for heterosexual reasons), Tracy insist Harry is "much prettier". At close we hear "Pretty Baby" again. Slight correction. You keep saying Tracy, but O'Hara's character is actually Tacey King. Lucille Ball played a character with a similar name (Tacy) in THE LONG LONG TRAILER. I do think Fox might have been concerned whether or not Webb was coming across too effeminate. He was a curious choice for LAURA a few years earlier, but I think the casting of Waldo Lydecker was more Otto Preminger's bizarre sense of humor at play. But it turned Webb into a bonafide movie star. At this point, Fox was trying to re-cast Webb in more likable roles after he'd played a murderer in both LAURA and THE DARK CORNER. The success of SITTING PRETTY set him on a whole new course, and they put him in a lot of family comedies after this (CHEAPER BY THE DOZEN; ELOPEMENT; FOR HEAVEN'S SAKE; and MISTER SCOUTMASTER come to mind, as well as the aforementioned Belvedere sequels). It could be that the character might have been a trifle too curious, maybe not so much "effeminate", for the Breen Office. That may explain why there is so much heterosexual hanky panky going on to off set any questioning. We had the same situation in many wartime films due to how many times soldiers were shown together as bro-buddies and WACs and lady riveters seen more affectionate with each other due to a lack of men around, this being compensated by all of the pin-ups adorning all barracks. Even the post-war musical (and wartime stage musical) On The Town makes a major effort to show our three sailors as girl hungry (even if they do dress in drag at one point and Jules Munschin flirts with a cop!). In Sitting Pretty, we have parents with THREE children and a fourth on the way, a female babysitter flirting with Pop, his boss accused of chasing women and getting perfumed letters from the opposite (not same) gender... and, very strangely, Clarence jealously (almost like a scorned lover) accusing Lynn of heterosexual hanky panky with Tacey (drinking out of a gin bottle and dancing). For his part, Harry does his best to pretend to be jealous. It's about time that its' "gay roots" were discovered. I view this movie like Top Hat (1935). "Don't mind me boys" as Madge says. The immediate post-war years are quite fascinating. This was when experimental films like Kenneth Anger's Fireworks actually got seen in a few inner city festivals, although one wonders who all saw Jean Genet's Un Chant L'Amour back in 1950. Probably not many, but that is France for you. Not the USA. Due to the Holocaust (when gay men were rounded up much like the Jews), I think there was some tolerance beginning. Again, you had the Kinsey reports making it less threatening to the masses... or more so? We did get McCarthyism and President Eisenhower pushing the pendulum backwards some years later. Crossfire (1947) was about Jewish prejudice when it finally reached the screen, but we have to consider that somebody read the original source material and at least considered it a possibility in its initial state before the obvious decision was made to pick a less controversial subject. Remember also that this was Bug Bunny's peak drag decade and nobody was complaining. What I find interesting about this particular film is how confident Lynn Belvedere is in himself. Like Katharine Houghton's Joey in Guess Who's Coming To Dinner, he "doesn't see any problem". Not that he does anything sexual in this movie. Just that he is proud about who he is regardless of what anybody thinks. Both the Kings obviously consider him a trifle weird, but get over it quickly. Tacey even removes the "hers" towel from the bathroom. In Sitting Pretty, we have parents with THREE children and a fourth on the way, a female babysitter flirting with Pop, his boss accused of chasing women and getting perfumed letters from the opposite (not same) gender... and, very strangely, Clarence jealously (almost like a scorned lover) accusing Lynn of heterosexual hanky panky with Tacey (drinking out of a gin bottle and dancing). For his part, Harry does his best to pretend to be jealous. Yes, a lot happens in this film. The only time I remember Webb playing a believable heterosexual, to my mind, was in Titanic, opposite Barbara Stanwyk. His scene with his young son near the end was beautifully done, with absolutely none of his trademark double-edged delivery. Also in Woman's World I think he was able to forego most of his usual flamboyant snarkiness and, even though he was playing an older unmarried man living with his sister, managed not to automatically read as some kind of closeted gay figure. Generally, I always felt his pursuit of women, when the script called for it, was in the interest of acquiring an adornment which would enhance his status (and be a believable beard), an "it" girl to reinforce his own relevance. (The same could be said of Addison DeWitt in All About Eve, another "urbane" sophisticate in search of legitimizing arm candy.) The idea that Waldo, as written, would actually lust for Laura seems highly questionable, so I think Preminger was onto the kind of complex rationale that sort of man would have for needing her enough to kill her if she were to reject him. Great post. In addition to the Waldo-Laura relationship, which you've mentioned, I think his relationship with Dorothy McGuire in THREE COINS IN A FOUNTAIN is equally contrived. I never once for a moment believe he is genuinely attracted to her. He's much more "realistic" as the fussy (often prissy) types he played in those family comedies. Regarding Laura, there are some interesting "curios" regarding Webb's Waldo. In the flashback scene, he initially appears repulsed by her because she is interrupting his lunch at a restaurant. Point made: he is not attracted to her when she is just a "dame" trying to get his advertising promotion of a pen. (It and his discussed venomous "quill" are quite Freudian and loaded with sexual symbolism; his suggestion of using a quill instead of a pen hints to her that he doesn't "swing that way".) Gradually he warms up to her because of her business skills and ambition remind him of himself. She soon becomes his protégé, since he thinks that, without him, Laura would not be a success. It is also interesting that his first meeting with investigator Mark has him naked in a bathtub. This suggests two things. 1.) By allowing himself to be exposed like that in front of a total stranger, he appears to have no secrets. Yet we know appearances are deceptive and this is why this movie is a mystery who-done-it. Some people will appear vulnerable, but are actually in control of every situation. 2.) On a subconscious "gay level", it could... potentially... suggest that he is testing Mark's interest in him. First Mark looks away when he gets out of the tub, presumably to respect his modesty, then later focuses on his silly baseball toy instead of Waldo. Uh-oh. Looks like Waldo will no longer favor Mark because of that! Intriguingly, this relationship parallels the relationship between Clarence and Lynn in Sitting Pretty, only Webb is playing the pursued who refuses to be pursued in that set-up while Clarence is the jealous attacker. Just as Clarence spreads dirt on Lynn's alleged "heterosexual" scandals in the King household, Waldo starts increasing his scorn of Mark that echoes how he felt before about Vincent Price's Shelby as well (although that may be more about losing Laura than any specific attraction to Shelby). Both Shelby and Mark are much more attracted towards Laura than him and to Judith Anderson's Ann (who promotes Shelby as a lover/friend). Mark even is attracted to Laura "as a corpse" thanks to a portrait. Waldo won't settle like Ann and just give in to nature's ways. JL....Really good analysis of Laura. My problem is that every time I watch it I'm so damned attracted to Dana Andrews that I forget about the plot. TB...Totally agree about Three Coins in the Fountain. It's so obvious that when Dorothy Maguire marries him she'll still just be a helpmate, this time an unpaid one. I wonder how Dorothy, an actress whom I respect, felt about having to play a woman that dense. I'm enjoying the discussion about Belvedere and Appleton, the "tempest in a teapot" aspect of their relationship. It reminds me of a series of comic novels about English country society by E. F. Benson, particularly Mapp and Lucia. Lucia relocates herself to a town which has always been Miss Mapp's domain, leaving her former home where she (Lucia) had been sole arbiter of every little thing. To say they clash is an understatement. 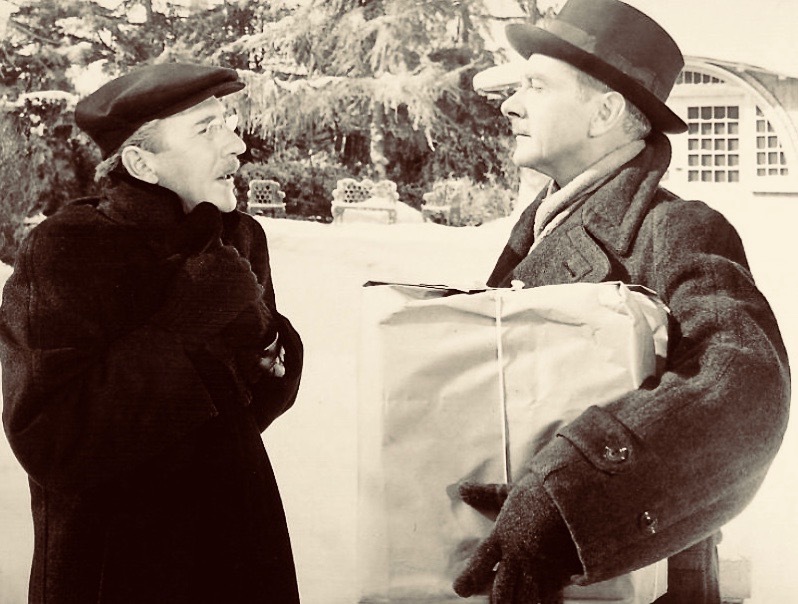 In keeping with our theme, Lucia's strongest ally is Georgie, a past-middle-aged gent of a certain unnamed "persuasion", but who is almost totally subservient to Lucia, unlike any character Clifton Webb portrayed. 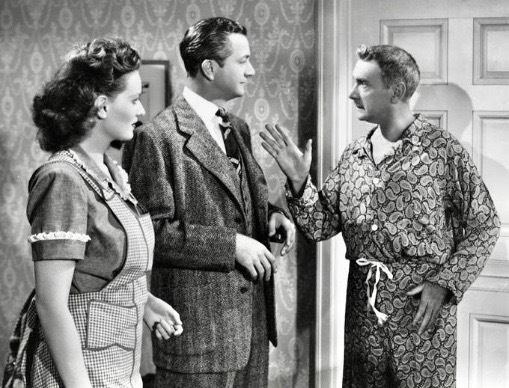 Clifton Webb was usually "in command" - and nowhere is that more evident than in "Cheaper By the Dozen" and "Elopement" and "Holiday for Lovers" - his "heterosexuals" were almost militant - if you crossed them, you did so at your own peril. This is also the case with his role in THE REMARKABLE MR. PENNYPACKER. Fox had a formula it used with him.